This is the innermost layer of a tubeless tire that prevents air from penetrating the tire. 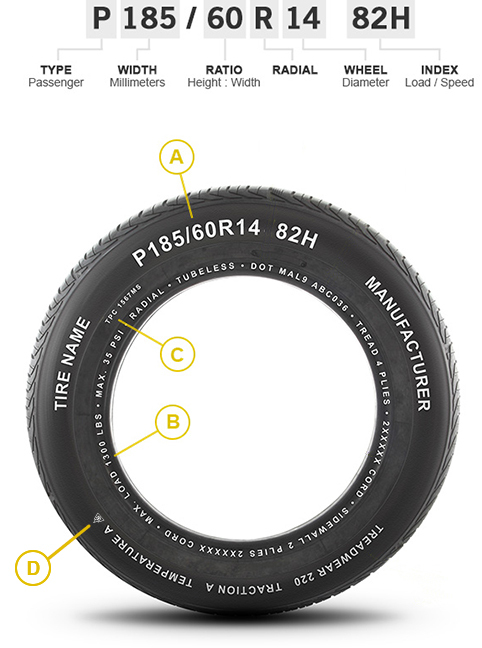 Since tires play a major role in establishing the performance and handling characteristics of a vehicle, many manufacturers require their tire suppliers to identify their Original Equipment (OE) tires with symbols or codes branded on the sidewalls. The goal is to make it easier for owners to identify and select exact replacements when their OE tires wear out. 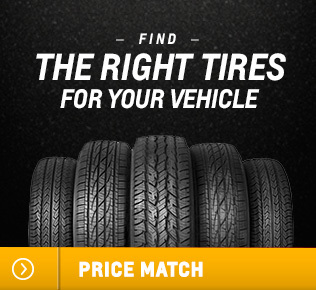 The information provided below will allow you to decode the information on a tire sidewall and help you make the right choice in replacement tires. Our Certified Service experts are always here to answer your questions and provide helpful advice. The tire size is a combination of letters and numbers used to define a particular tire's width, height, aspect ratio, construction type, and service description. This information tells the maximum load that can be carried and the maximum pressure needed to support that load. Please note that you should always inflate your tires to the pressure noted on the tire pressure placard (typically located on your driver door frame) or in your Owner’s Manual. Most OE tires designed to the manufacture's specific tire performance criteria have a TPC spec code molded onto the sidewall. Tires designed specifically for use in winter conditions (snow, slush, ice, and low temperatures) feature a three-peak mountain snowflake symbol.